Some hard work on and off the mound has left Jordan Montgomery feeling stronger than ever at this point of the season. On Friday, the result was perfection. The Yankees' No. 27 prospect retired all 18 batters he faced, fanning eight, as Class A Advanced Tampa coasted to a 9-3 victory over Daytona at Jackie Robinson Ballpark. "I had my fastball, changeup, curveball all night," Montgomery said after improving to 6-5. "I got a lot of swings and misses on my changeup and threw my curveball in the dirt when I was ahead in the count for swings and misses and strikeouts." It didn't take long for the southpaw to notice the zeros that continued to fill up the scoreboard. "About the fourth inning, I kind of realized it had been 1-2-3, 1-2-3, 1-2-3," Montgomery said. "I just really focused on the first guy and went from there every inning." His teammates certainly weren't saying anything to him about it. "No way, no one tried to jinx it for me," Montgomery said. The 22-year-old got Tortugas shortstop Blake Trahan to ground out to second to cap his sixth perfect inning and wasn't surprised to learn there would not be a seventh. The Yankees opted to send Chance Adams to the mound to start the next frame. "I kind of had a feeling it was going to happen, just because I knew Chance had to get some innings in after me, just piggybacking a little bit," Montgomery said. "I was just happy to be out there for six and keep the team in it and give us a good outing to win." 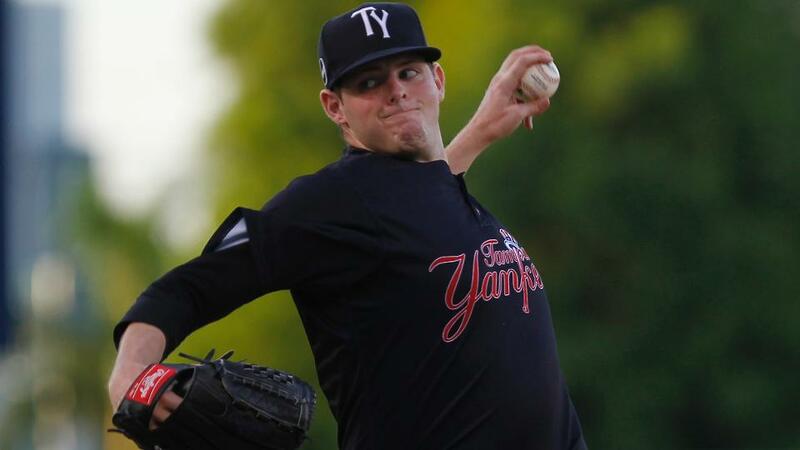 The South Carolina native left the dugout to complete his post-start exercises and didn't see as Adams struck out Ty Washington before Brian O'Grady walked to end the Yankees' bid for a perfect game. One out later, Sebastian Elizalde -- mired in an 0-for-14 slump -- broke up the no-hitter with a double to the right-field gap. When Montgomery returned to the dugout, he heard what had happened but was unperturbed. "We still won, so that's all that matters," the 2014 fourth-round pick said. Montgomery has been solid since being promoted from Class A Charleston in late June. The 6-foot-4 hurler has gone at least five innings in each of his 14 starts with the Yankees while posting a 3.05 ERA over 85 2/3 frames. Despite logging so many innings, Montgomery said he still felt strong Friday night. "I felt really good tonight, actually, a lot better than the end of the year usually feels," he said. "I feel like my body feels good and my arm's still definitely above me. "Stuff-wise, I think this is one of the top [starts] I've ever had. I've been working a lot with [Tommy Phelps], our pitching coach, and just working on my mechanics, moving on the mound. … Then our strength coordinators have really been keeping my body in shape." Montgomery also said he has a fairly simple plan for building off his best start of the season. "Obviously, what me and Phelpsy have been practicing has been working," he said. "Gonna need to start practicing that some more tomorrow." Yankees No. 20 prospect, Dustin Fowler plated four runs on a double and a single, while Michael O'Neill fell a triple shy of the cycle for Tampa. No. 20 Reds prospect Jackson Stephens fell to 12-7 for Daytona, surrendering six runs on eight hits and a pair of walks with three strikeouts over four-plus innings.